My first two weeks at site have been conquered. Every day has been interesting and surprisingly busy. I’m still learning who people are, who’s related to who, and who’s in charge of what. I’m afraid that’s going to take a long time to tackle. I’ve also been lost a few times… but the extra bike mileage is bonne pour la sante, ka? I know I’ve halfway described my village before, but let me try again. Koba is not quite a city and not quite a village — it’s big enough to have a nice road and mostly everything I could want, but not so big that it feels cold and fast-paced like cities tend to. We’re real Basse Guinea out here — low, flat plains lining the coast. Humid, tropical climate with the ocean breeze cutting the heat. Palm trees everywhere you look. Overwhelmingly green surroundings — and this is during the dry season. Koba proper is 35 kilometers long and is separated into districts and small villages. Koba Bassengue, where I call home, is 5 kilometers from the port that marks the end of Koba. The port is a bustling center of commerce. Boutiques line the road offering all sorts of services — telecharging, hair cuts, odds and ends, rice and sauce. A swarm of young men and motocycles constantly circle the area searching for someone to taxi off. Cars drive in and out filled to the brim with people, animals, and goods heading to various destinations… maybe a far off district of Koba, maybe the next biggest town where they will find another taxi to continue their destination. At the mouth of the water, boats come and go, loading and unloading their haul. A line of men can constantly be seen picking through fish nets, collecting the catch and sending it off to either the market or the large buildings where fish are dried. And through this all children are running around, friends and family members are greeting one another, and I stand out like a sore thumb as people wonder just who I am and why I am here. As I said, these two weeks have been busy. My counterpart is extremely motivated and has created a full schedule for me. I’ve been given an office in the Commune Rural, which is kind of like a town hall. For example, my office is right next to the Mayor’s. It’s really flattering and telling of the respect my town already has for me. The office is about a 10 minute bike ride from my house. Every morning, I leave my house at 8:30am and greet every person I see along the way. At the office, Mangue (my counterpart) has been working on a detailed map of Koba for me and the distances between all the sectors. He is a trained architect and his skills are showing — the map is stunningly detailed and well made. While he works on that, I translate sentences I’d like to ask people from English to French and have Mangue check them over. I need corrections less and less! We have been going around to meet the various important members of Koba. Because Koba is so big, there’s a lot of ’em. Sometimes people come to the Commune Rural for meetings but mostly Mangue and I go out to them — him on his moto and me huffing along on the bike. I have visited gardening collectives, fish drying collectives, imams, the Sous-Prefet, and the Mayor. These morning excursions are usually finished by 12:00pm. I bike home in the full severity of the West African sun, search for the key that I always seem to lose, peel off my sweat-covered clothes, and proceed to lay on my floor. Sometimes I take a nap, sometimes I read. When my body temperature has returned to normal I head outside and hang out with my host family. 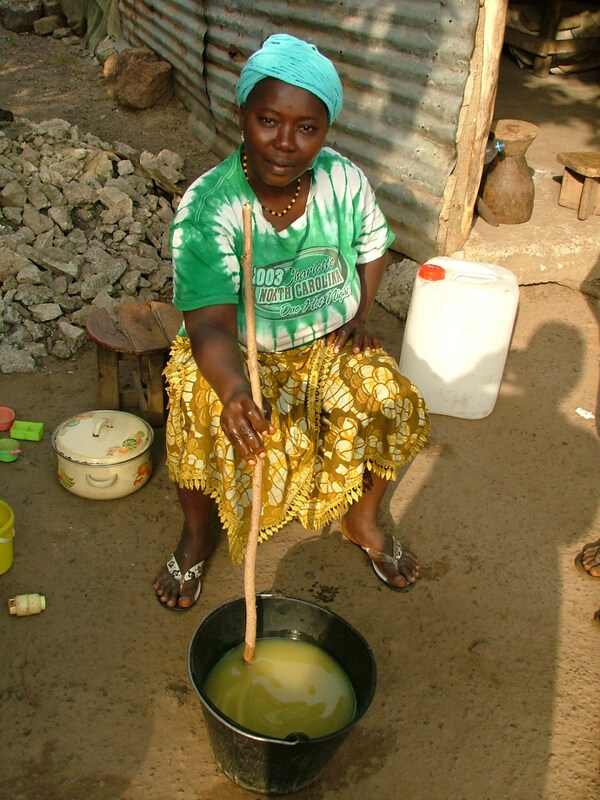 To both kill the time and butter them up, I help with practically everything — preparing food, washing clothes, fetching water. Do you know how to tell when palm fruits are ripe? When they fall out of the pod without much effort. How about kola nuts? When they are covered with a fine reddish brown powder. Just how many bidons can you carry back home from the well? 2; farmer walk with clenched abs. How do you wash a child? Forcefully. These are the things you learn in Koba down time. At 5:00pm, I go to work at Mangue’s garden. He’s got a vast family-run operation back there. And “there” really refers to a slice of Paradise. As I walk through the beds, the rich black soil oozes between my toes, egrets watch me from a far, childen climb trees and laugh and I see the true beauty of the world. He mainly grows peppers, tomato, and corn but we just planted the seeds I was mailed from USA (shout-out to my awesome step-dad, Mike!) and some I took from the Peace Corps seed bank in Boke. In total — broccoli, basil, lettuce, spinach, cilantro, oregano, thyme and chives. They were all planted on 15/2 and as of 20/2 the broccoli, spinach, and thyme have sprouted. God willing, I will get to eat broccoli out in the bush. 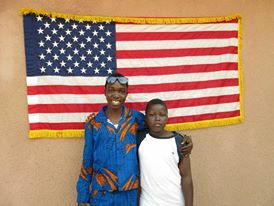 Mangue is extremely excited to get a taste of USA and said we will name the vegetable that comes “M’mah Camara”. We work hard in the garden. Every night I fall to bed, exhausted, by 9:00pm. It’s not easy, but it’s rewarding. There is a lot of space and we hope to create irrigation canals so we can use all of the land come rainy season when it usually floods. We also have plans to create more beds to grow watermelon, various squash species, and pineapple. This is all very exciting to me because the only vegetable offerings here are pepper, onion, eggplant, corn, and tomato. I’m hoping to introduce some variety here. The soil and climate is extremely rich so I think we may have some luck. On va voir. Next week I am going to start going to the gardening collectives during their assigned days of work and helping out. I am supposed to spend my first three months at Koba performing a community needs assessment. That really boils down to getting to know everyone, figuring out what the hell is going on, and how I can attempt to improve it. The only way to properaly accomplish all that is to get out there and get dirty. 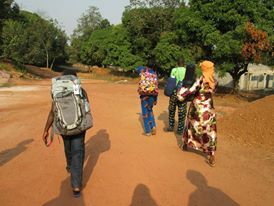 People are slowly starting to recognize me, but it’s a full-time job convincing the kids of Koba that my name isn’t Fote (foreigner), Salimatou (the towns 1st PCV), Aminata (the towns 2nd PCV), or Kadiatou (my site mate). I’m sure that’ll be a long struggle because all Fote’s look the same (that’s a blague). I have been hearing a few M’mah Camara’s, which warms the soul and is warranted considering I greet (a 5-6 phrase process in Susu) literally everyone I see on the streets. I’m going to come back to America frendlier than ever. I’m settling in well. I love meeting new people and I’m having fun exploring. Its absolutely beautiful here. Yesterday I biked back the long way from a meeting at a garden — instead of taking the main paved road through the town, I biked across the rice fields to the beach and took a dirt path along the ocean home. Everywhere I look is a new slice of beauty waiting to be discovered. I’m happy, stronger mentally and physically than I’ve ever been, and really flourishing. I also feel more spiritually connected to the world than I ever have. I have plans to explore the beach, the nearby island town, the palm plantations, my neighboring sectors — it all! I’m working on unpacking, thinking about buying paint for murals inside my house, and constantly bugging the local carpenter to finish the shelves I ordered. If anyone has any inkling of a desire to visit and my descriptions weren’t enough to draw you in, I should mention there’s a lakefront resort waiting for you here. Did I mention I live in Paradise? A la prochaine. Thinking of you all often. G25 Basse Cote Volunteers eating a family dinner with our Regional Coordinator and guard. We made italian food! Alia, my 4 yr old host brother in Dubreka. 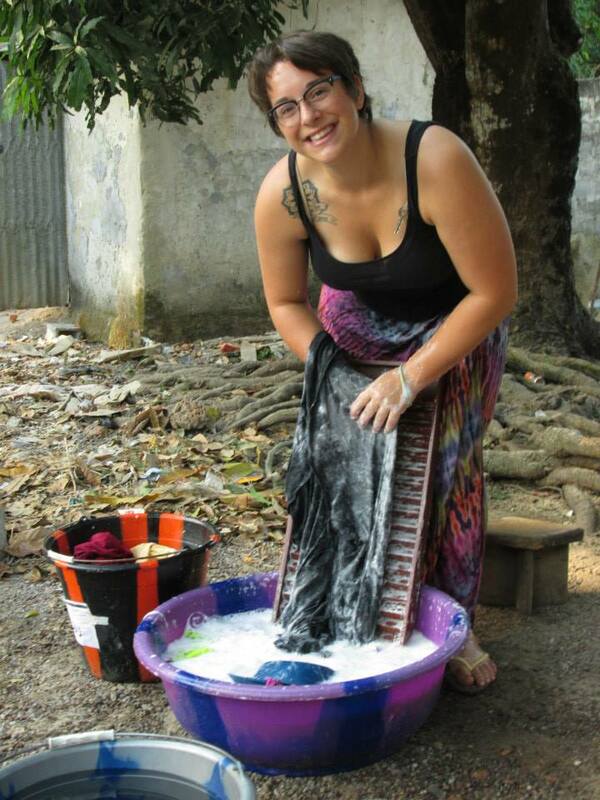 Washing clothes in Dubreka. This was clearly taken at the beginning of the process because I’m not covered in soap and sweat. 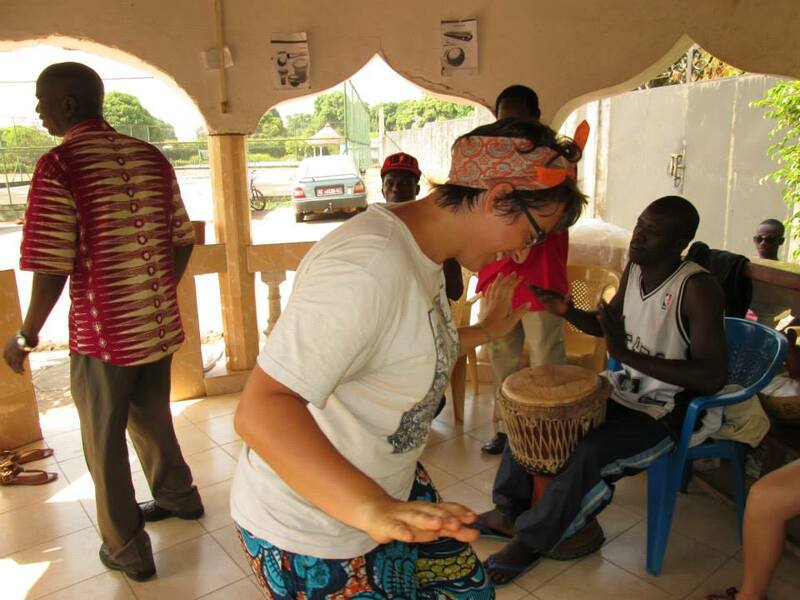 Jamming with some local drummers during a cultural fair we had at the Peace Corps bureau in Dubreka during PST. M’balu,, my host cousin in Dubreka. 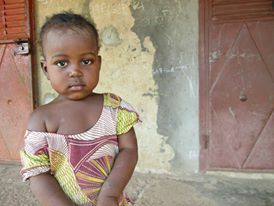 During the 2 months I lived with her, she learned how to walk and stopped breast feeding. My host-brother Mamadi and host cousin Seydouba at the swearing-in ceremony in Dubreka. En route to the swearing-in ceremony, AKA moving out of Dubreka and to site. Thank god for large families to help carry everything! 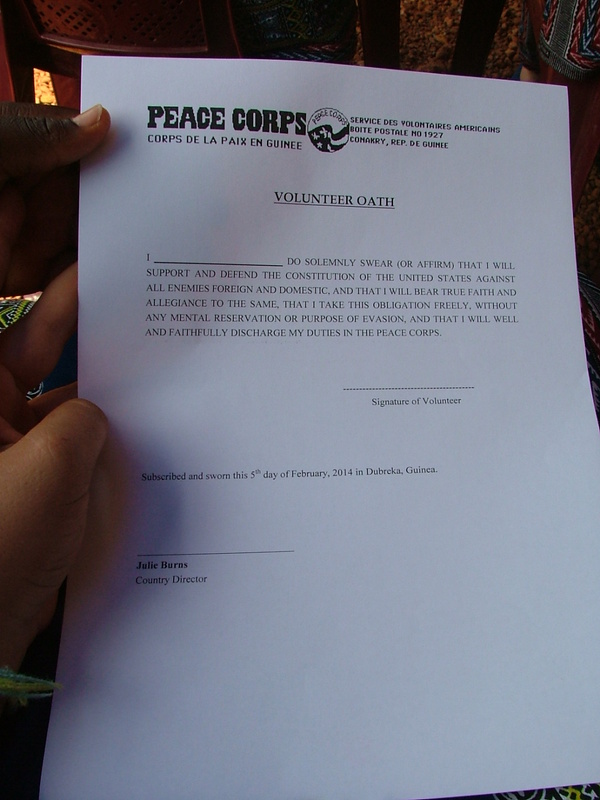 As of this posting, I am an official volunteer with the Peace Corps. Although the days in Dubreka sometimes passed slowly, the past two months have flown by. I came into this country positive and outgoing, but in the past two months I have really come into myself. I am proud of what I have accomplished here, proud of the connections and friendships I have made, and excited for what is to come. Me and my host-mother both teared up when we said goodbye. When they walked away, I bawled. 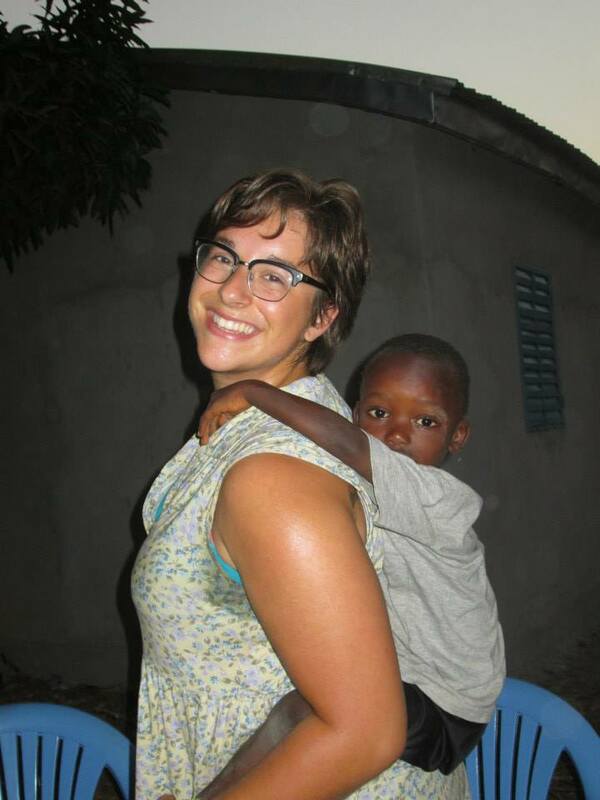 I really have felt at home here in Guinea, and that has been due to them. Luckily my site is only 2 hours away so I will be able to visit. It won’t be the same, though — and that’s what’s sad. But goodbyes are unfortunately a part of life. I learned that by saying goodbye to America, goodbye to friends, goodbye to college, goodbye to Brazil — I’ve had a lot of practice, it seems. It hasn’t gotten easier but I know the importance of staying in touch. 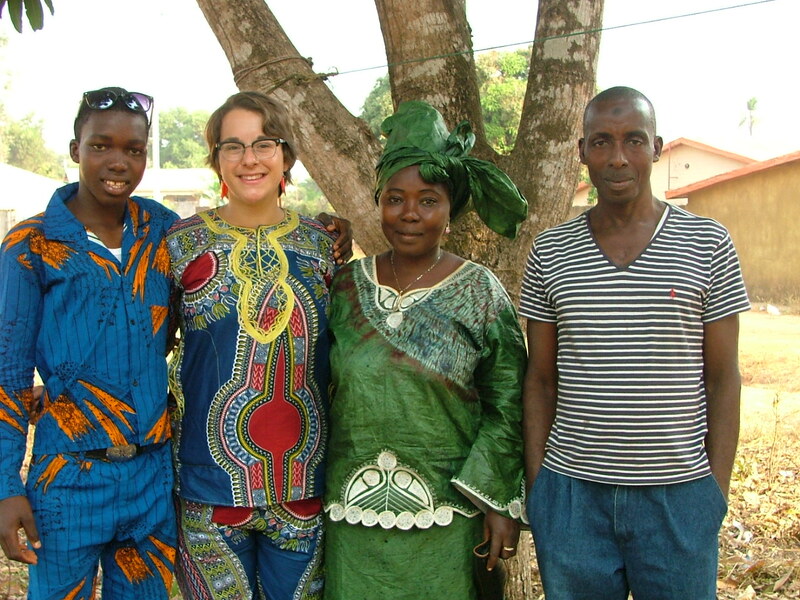 One thing I’ve already learned from Guineans is the importance of family and friendships. Guineans are the most loving and giving people I’ve met. They will give you the shirt off their back if you say you like it and they will call you just to tell you their salad tastes good. Just today, I was at the bank in Conarky and I met a woman named M’mah Sylla — my name is M’mah Camara. We started talking and joked about how the Syllas are theives, no, the Camaras are theives, no Sylla! (There is a lot of running rivalries here between family names). We talked for maybe 5 minutes and she asked for my phone number. She’ll probably call me a few times just to ask how I am, if there’s evil in my life, if everything is good, if my family is healthy. People here care. I’ve never been so happy to be where I am in life. The past years of my life have been headed in a positive direction, but always had some level of anxiety about “what next???”. Here, I am at ease. I am happy. I am joyous. I am content. I feel that I am in the right place and doing what I should be doing with my life. Over the course of the next few days, I will go shopping for various food items, possibly a smart phone (ayyy internet! 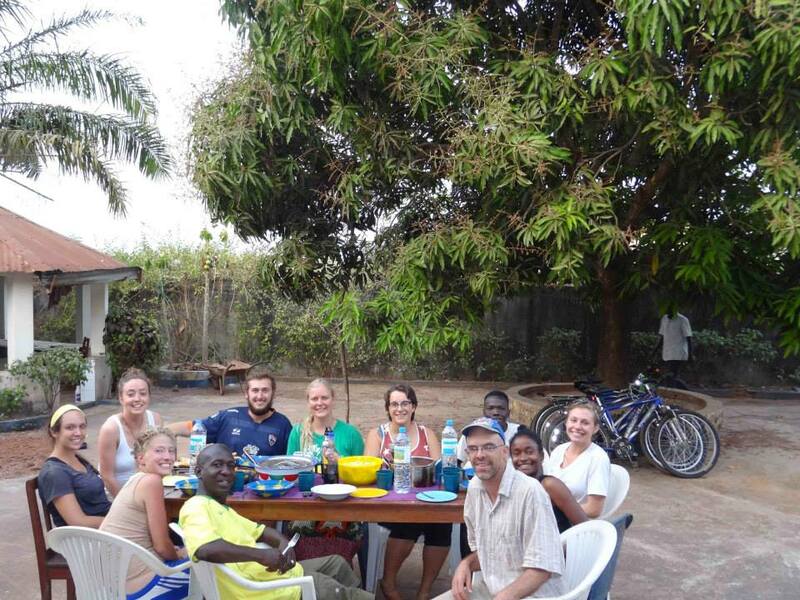 ), and hang-out in Conakry. Then, I will go to Boke to meet the Prefect and the Mayor. Then, I will be at site. The first three months have been said to be the hardest. Life will switch from training 8:00am – 5:00pm to being completely on my own. I’m going in roaring and ready, though. I’m ready to be back at my beautiful site and begin getting to know my community, my new host family, my counterpart, and my site mate! I don’t have a singular complaint. Diarrhea is a real thing, but it’s really not that bad. Electricity is already something of the past. Internet, shminternet. It’s funny how quickly you adapt. I’m happy here. My sweetheart, Alia. He is my host-brother in Dubreka. A 4-yr old ball of energy and cuteness. My speech, the swearing in schedule, and my expert card stating why I’m here in Guinea. I gave a speech in Susu at our swearing in. Probably one of the most amazing moments of my life. Learning French and Susu in only 2 months is a crazy accomplishment, and the crowd was applauding almost every sentence I said during the speech. They laughed at my joke! C’ete bien passe. The best thing about speaking Susu, and my motivation for learning, is seeing people light up when you speak their language. It really is the reason why I’ve integrated so well. The crazy oath we took to make us official US GOVERNMENT EMPLOYEE/VOLUNTEERS!!! Making soap with my mom. 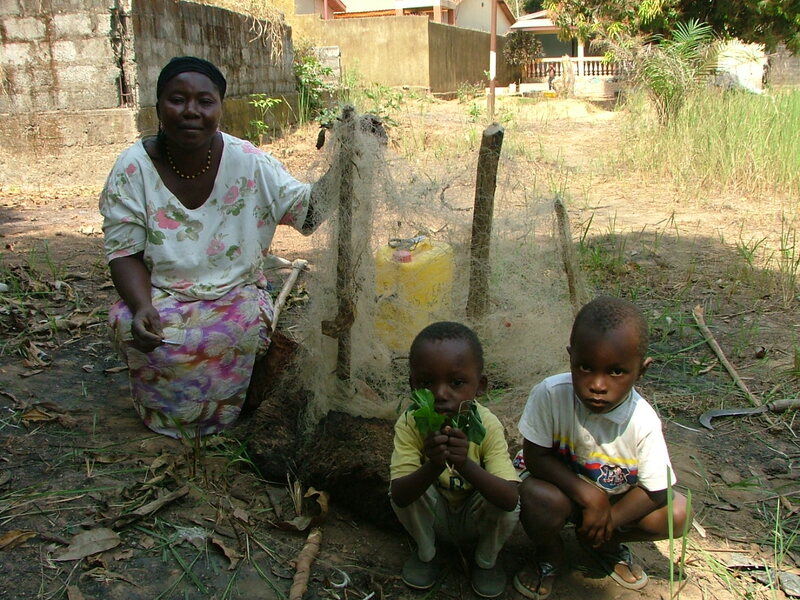 My mom and petits with the Moringa tree we planted. 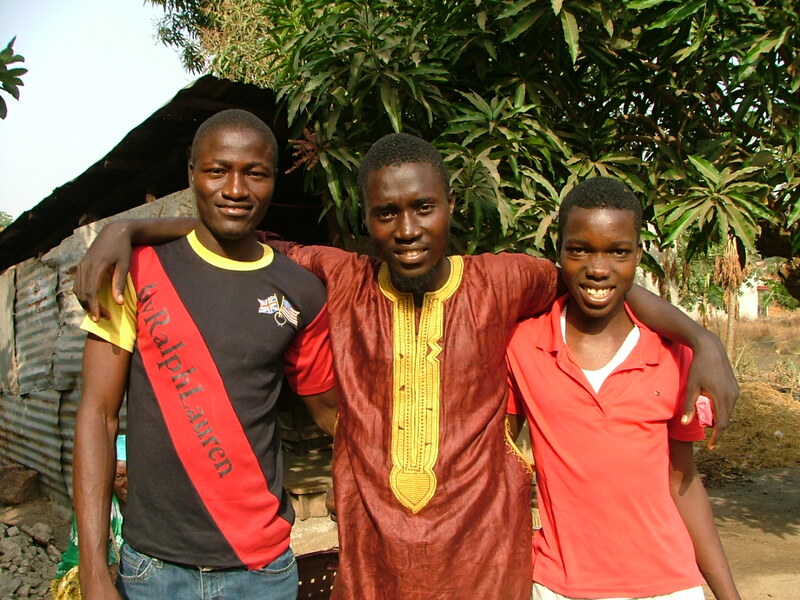 My three Dubreka boys — Lamine, a family friend. Ostage, an imam / super religious arabic teacher, but hilarious and open-minded and intelligent guy. Mamady, my host-brother and best friend. Aboulaye and Alia, my two little brothers. The outfit I’m wearing was a goodbye gift from my family.